How many times have you passed a pasture, caught the sight of a horse that looks skinny, disheveled, or in poor health? You pass on by, wonder what's going on, and vow to check again the next day. Again, the same sad scene. After several days of witnessing what looks like a starving, neglected horse, you decide to do something. But where do you start? Do you think about what will happen if you take possession of this poor equine angel? Do you have the knowledge and understanding of what would be involved in rehabilitation of this animal? How far ahead do you think? If you're like most, all you want to do is get that sweet pony out of such a horrible condition! Act now, think later!!! Unfortunately, as noble as rescue may seem, it's a scary, expensive prospect in reality. I have a small horse rescue/youth ranch here in Bentonville. We've adopted/rescued 25 horses since we started in 2009. Some were adoptions from loving homes, but owners, due to health reasons, income changes, divorce, etc, needed to rehome their horses and didn't ever want them to end up at the sale barn. Some were from dire situations, starving, neglected, unloved. Still others have special needs that require constant monitoring and care, making them unsuitable for sale. We've had all manor of horses here. 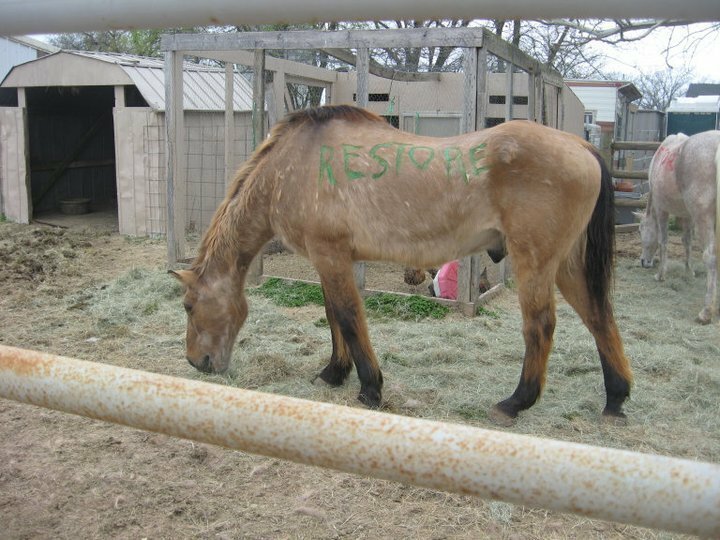 But here are some very important things to consider if you are wanting to "rescue" a horse. First: You have been following a horse that seems in a dire situation, don't rush in and pass judgement without the facts. Elderly horses wither with age, just like we do. The horse you see in that pasture may be skinny but it could be elderly and the owner is doing all the right things. 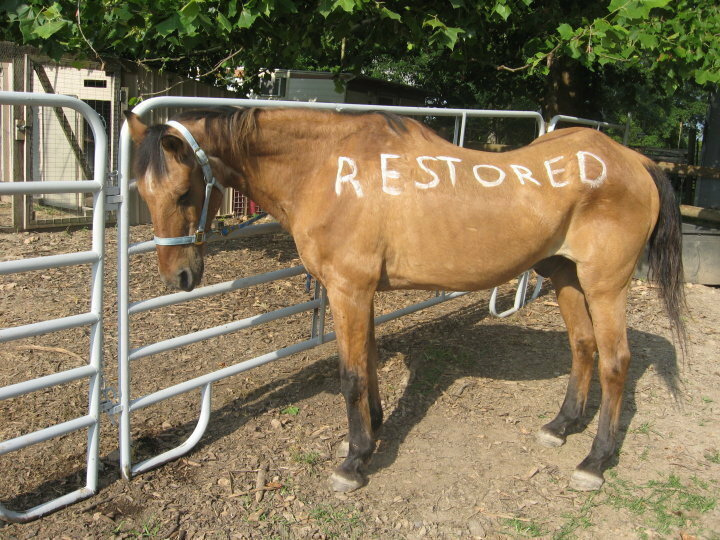 The owner may have rescued the horse and you just don't see the feed or forage. If you have a concern about that situation, call the sheriff or local police department. They have to do a welfare check on that animal. Follow up with law enforcement to make sure they were able to get information on the situation. Animal abuse is a felony in Arkansas and quite possibly your state too. They have to investigate. You don't ever want to confront an owner on your own. You just never know what may happen. You also cannot just move in and take the horse. YOU'LL be tossed in jail. You CAN knock on the door and offer to buy the horse. Rescue doesn't mean "free to good home". In many situations, you have to purchase the horse to save it. Second: If you are fortunate enough to obtain possession of the horse, get it to the vet BEFORE you bring it home. The horse will need a full evaluation by a vet to find out what, if any, health concerns there are. If you have other horses, quarantine is a must. Chances are, the horse you have just acquired isn't current on coggins or anything else. You also need to find out of there are any special needs for the horse. Most often, the biggest issue is malnourishment. 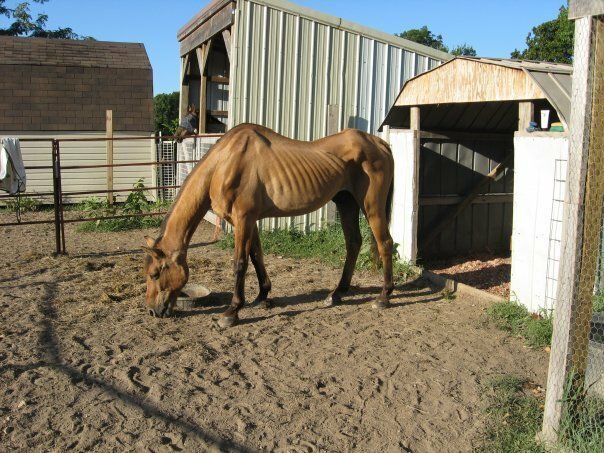 A horse that's been in a field starving needs to be fed slowly and frequently in small amounts several times a day. Having the horse's teeth floated is very important as well. Your vet can give you valuable instructions on how to get the horse back to good weight and health. For the sake of the horse, you don't want to just start giving it a bunch of stuff right off the bat in hopes of it helping him. Having been denied good forage and feed, then reintroducing a pile of all sorts of supplements and grains can colic him. You sure don't want that! Third: Horses that have been in tough shape for long periods of time are pretty delicate. The digestive systems of horses are the most tentative system in their bodies. It's hard to believe that a 1200 lb animal can be so fragile but they are. Also, because of the lack of good food, the horse can develop founder, stress ulcers, skin conditions, vision issues, that's just to name a few. All can be very, VERY costly. Supplies, vet bills, medicines, it's all very hard on the wallet. You have to go the distance with your rescued angel. That distance can include having to make hard choices. You may have rescued this sweet animal only to find, months down the road or sooner, you have to call the vet to mercifully put him down. Rescue is a heartwarming thing. To take a shattered horse, nurse him back to health, gain his trust, and help him to be a wonderful companion and friend is amazing. Rescue is also so heartbreaking. We've brought home horses that we can't help. What we can do is give their last days beauty, love, attention and every chance available to us. If you are interested in rescuing horses, talk with your vet before you start. These horses aren't easy keepers 90% of the time. I have two out of our current 16 that are easy and have no special needs. That means vet bills, special diets, meds, supplements, etc for 14 of them. I don't want to be a discourager, but I do want you to be aware that thousands of dollars can be spent on just one rescue horse, depending on the situation. You may not know that situation until you've already rescued the animal. Do your research but the best thing is talk to your vet and farrier. They are THE most valuable people to you in a rescue situation. You want your vet to be straight forward with you, even if it's stuff you don't want to hear. Same with your farrier. A died in the wool good certified farrier can be the difference between having your rescue for a long time or not. No hoof, no horse. You need to be picky and they need to have good knowledge of anatomy, hoof conditions and be dependable. "There is nothing better for the inside of a person than the outside of a horse"